The 2014 Sas Vektor Adria 1002 V motor boat is a smart choice for those wishing to experience a new sense of freedom in style and comfort. Jump aboard this Sas Vektor Adria 1002 V in Sukosan and get ready for a high-speed adventure at sea with your friends and family. The Sas Vektor Adria 1002 V accommodates up to 7 guests and is perfect for exploring secluded coves and beaches in Croatia. The Sas Vektor Adria 1002 V is located in D-Marin Marina Dalmacija (Sukošan), Sukosan, a convenient base to start exploring Sukosan on a chartered motor boat. 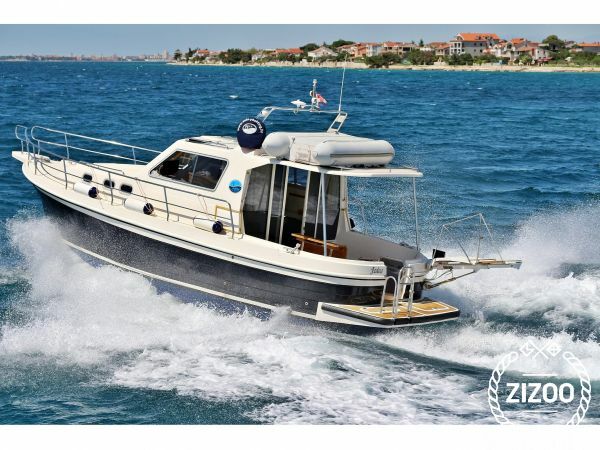 Learn more about the Sas Vektor Adria 1002 V motor boat below. sehr schickes und günstiges motorboot! kann ich empfelen!